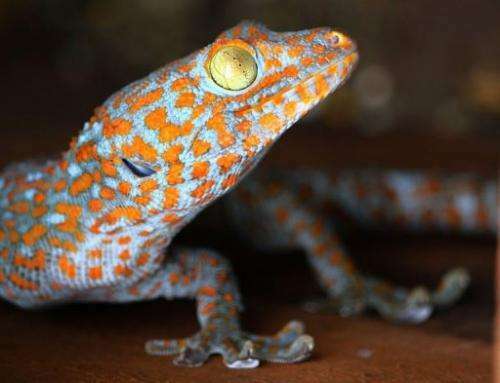 Activists have warned that wild populations of Southeast Asia's striking Tokay Gecko are in danger of being over-hunted for use in traditional medicine in China and other countries. 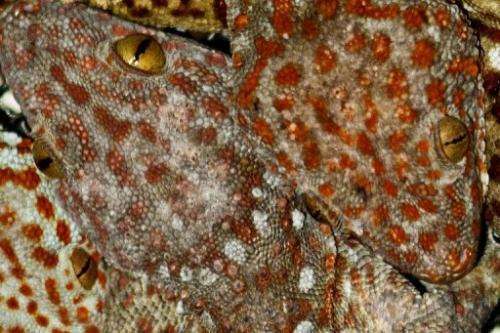 Activists warned Thursday that wild populations of Southeast Asia's striking Tokay Gecko were in danger of being over-hunted for use in traditional medicine in China and other countries. 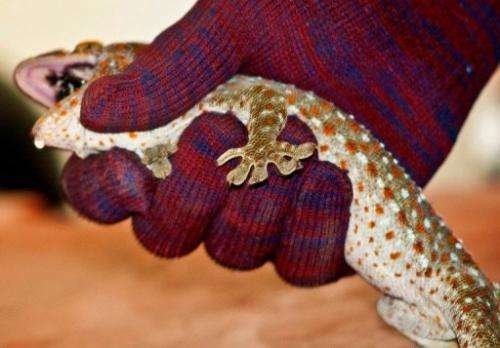 Calling the trade "colossal", wildlife trade monitoring network TRAFFIC called on authorities in the region to implement tougher regulations and limits on commerce involving the lizard, the second-largest gecko species. "The majority of Tokay Geckos consumed as part of this trade are harvested from the wild," said a new TRAFFIC study. It added that despite high reproductive rates and adaptability, Tokay Gecko populations "are still susceptible to over-harvesting" and said population declines have been reported in countries like Thailand and Indonesia. An orange-spotted Tokay Gecko is shown in Betong town near the Malaysia-Thai border in 2011. The Tokay Gecko measures up to 40 centimetres (15 inches) long and over 300 grams (11 ounces) in weight and is distinguished by a brilliant coating of spots that range from bright yellow to red and its loud croaking call. The Tokay Gecko measures up to 40 centimetres (15 inches) long and over 300 grams (11 ounces) in weight and is distinguished by a brilliant coating of spots that range from bright yellow to red and its loud croaking call. It ranges throughout Southeast Asia and is not a protected species in most countries. It is used in traditional medicines in China, Hong Kong, Taiwan and Vietnam to treat asthma, diabetes and other ailments, TRAFFIC said, adding that an individual specimen can command hundreds of dollars. TRAFFIC said while the overall volume of the trade was not known, import data showed Taiwan alone has imported 15 million of the geckos since 2004. An orange-spotted Tokay Gecko is shown in Betong town near the Malaysia-Thai border, in 2011. Wildlife trade monitoring network TRAFFIC says population declines have been reported in countries like Thailand and Indonesia. Trade accelerated in recent years amid rumours the geckos could help cure AIDS, which the World Health Organization has refuted. TRAFFIC said that belief has since faded but the traditional-medicine trade continued, and called for research to gauge the impact on wild populations. I have a couple around my house. Now I understand why they make a noise that sounds like they're sayin, "phuk you!"